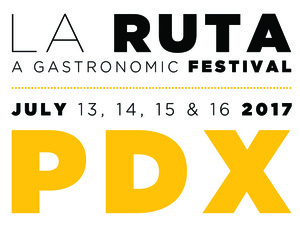 La Ruta PDX: A Gastronomic Festival is an industry- and trade- focused event series celebrating the culinary culture of Spain in Portland, Oregon from the 13th to the 16th of July 2017. Chefs from Spain will join forces with chefs from Portland in a series of collaboration dinners. Events throughout the festival will showcase Spanish products, purveyors and specialty equipment to encourage collaboration and mutual enrichment between the two gastronomic cultures. This year’s guest traveling chefs and ambassadors include Michelin-starred chef Manuel Alonso of Casa Manolo in Valencia, Basque chef Mikel del Luis chef Juanjo Canals of Con Amor in Madrid, Jordi Parra formerly of Ferran Adriás Michelin 3-star restaurant elBulli, David Ramos from Klimer in Madrid and Spanish food insider Alex Cardona of Aborigens in Barcelona. Spanish chefs and ambassadors will collaborate with Portland chefs in an exclusive dinner series at Toro Bravo, Can Font, Bar Casa Vale, Urdaneta and Park Ave Wines. The festival’s paramount dinner will feature a collaboration between all guest Spanish chefs at Plaza Del Toro. Live Wire host Luke Burbank will moderate a panel with the chefs at the festival’s finale, Tastes of Spain, at Director Park in downtown Portland. Spanish winemakers include Ana Lopez of Gramona Winery, Xavier Exteve of Avinyó Winery and Benoit Petillon of Faustino Winery, Victor Charcan of Bodegas Roda and Albert Jane of Bodegas Acústic Celler. More than 50 wines will be presented by winemakers, importers, and distributors throughout the festival at the feria and trade show, Tastes of Spain, collaborative dinners and wine seminars. VIP festival tickets will go on sale Monday, May 15th and include VIP access to the festival premiere party and private film screening, early VIP access to the feria and trade show, early VIP access to Tastes of Spain, access to exclusive after parties each night of the festival and a seat at one ambassador dinner of choice. Ambassador dinners are limited to 10 VIP tickets per dinner and are first come, first serve. Only 50 VIP tickets will be sold. General admission tickets will go on sale Tuesday, May 16, 2017. Proceeds from the festival benefit The Portland Kitchen, a nonprofit using food and cooking to change the lives of underserved youth. Please view the event website for the full schedule of events.